You will need to make sure you have the Apple Store app for the iPhone. 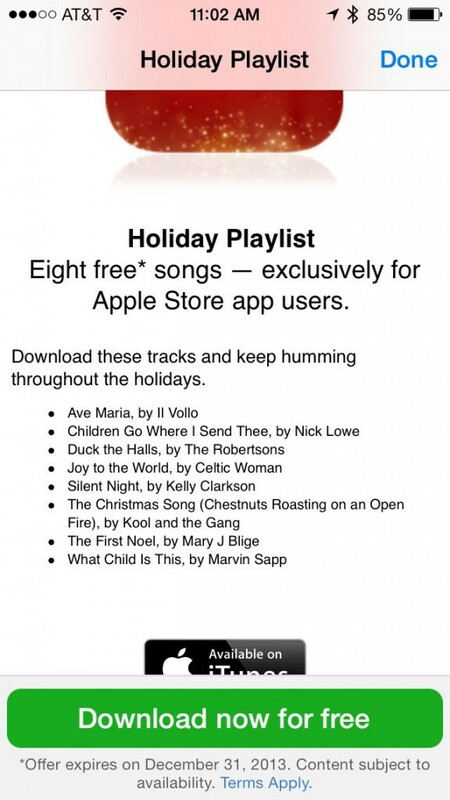 I am not referring to the iTunes Store, or the App Store, but the Apple Store app. If you don't already have it, no worries. It's free. It may still feel like you're in the wrong place. Don't worry. you're almost there. Scroll down till you are almost at the bottom of the page. There, you will see a listing for holiday cheer. That's the one. Before you can enjoy your new tunes, you have to wait for them to be downloaded. After that, you have to find them. You like scavenger hunts, right? The obvious location would be the playlist called, "Recently Added". Good luck finding them there. Now, don't you feel silly? Try again. Wrong again! Now, you're just embarrassing yourself. Playlists was the right idea. What you're looking for is Purchased Music. The new songs should be the first eight in the list. Enjoy.